It’s no secret that Disney World has a variety of sit-down restaurants. 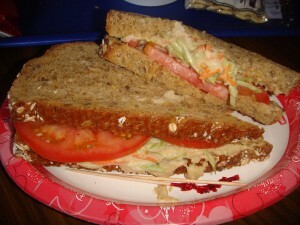 However, did you know that Disney World has a plethora of unique dining experiences that are quick service? When most people think of a fast theme park meal, they think of burgers and fries or other typical American fare. That’s not the case with Disney. While you can definitely grab a (really good) burger, there are many more options available to you. Let’s take a look at some unique meals throughout the Walt Disney World parks! Magic Kingdom has come a long way in recent years to appeal to different taste buds. At my favorite counter service restaurant in the park, Columbia Harbour House (menu), you have the option of the Lighthouse Sandwich, which includes hummus, broccoli slaw, and tomato. It’s really flavorful and actually quite filling. There are also many platters of various seafood, vegetarian chili, and even a really delicious clam chowder. Nearby, Sleepy Hollow (menu) is also cooking up something truly unique and very very tasty. Didn’t you know? Waffle sandwiches are all the rage in Liberty Square. I recently tried the fantastic Nutella and Fresh Fruit Waffle Sandwich. It was HUGE and really good. Sleepy Hollow also creates a waffle sandwich with spicy chicken and another with ham, prosciutto, and swiss cheese. Crazy, right? Yeah! Crazy good! 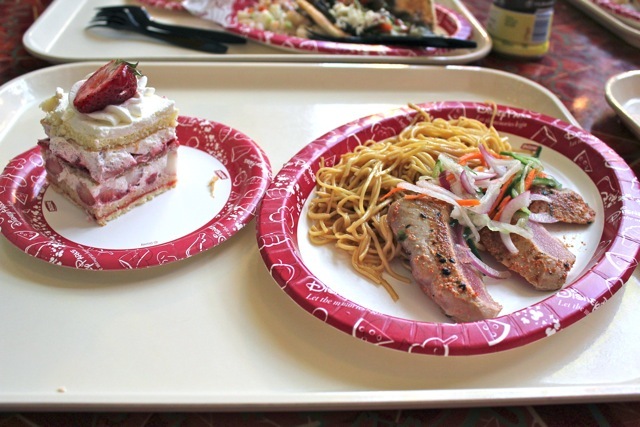 Taking a look at Animal Kingdom, everyone knows about Flame Tree Barbecue and its menu of meatalicious (I just made that word up) offerings that are definitely above and beyond most theme park dining options. However, most people forget about a place in DinoLand U.S.A. called Restaurantosaurus (menu). One of my favorite counter service meals in all of Disney World is right here. The Shrimp Po Boy is unique and delicious. Instead of typical fries, I order sweet potato fries on the side because they are healthier and more tasty. There is always ample seating available and, as you may notice, the theme of the restaurant is really fun. I am the biggest fan of Epcot for many reasons, and one of those reasons is definitely the variety of food found all over the park. Undoubtedly, the largest counter service restaurant in all of Epcot is Sunshine Seasons, found in The Land pavilion. People bypass it while heading for Soarin’ and end up missing out on a gem. For breakfast, lunch, and dinner, Sunshine Seasons has got you covered. There are different stations with all sorts of food to choose from. I recently discovered the Togarashi Seared Tuna Salad. If they ever get rid of this, I’m going to cry my eyes out. That’s seriously how much I love it. Please, do yourself a favor next time you’re in Epcot and grab a bite at Sunshine Seasons. You won’t be disappointed. Obviously, Epcot’s World Showcase is the cream of the crop for unique eats in Disney World, but I think it’s important to point out a few places that sometimes get skipped over. For some reason, the Norway pavilion’s Kringla Bakeri og Cafe (menu) is just thought of as a dessert bakery. That is so not true. 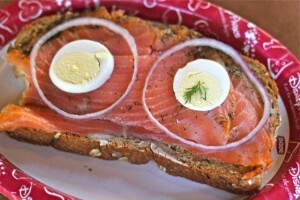 I had an amazing Salmon and Egg Sandwich a few months ago that knocked my socks off. It’s served on a flat piece of bread with smoked salmon, red onion, egg, and a little dill. What a healthy alternative to chicken strips and fries! 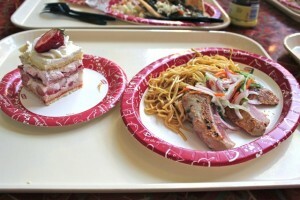 I’m rounding out my list with perhaps the most exotic fare available in all of Walt Disney World, Tangerine Cafe (menu). Head over to Morocco in the World Showcase, and you’ll find a selection of Middle Eastern food sure to please. I really like the Falafel Wrap, which is served with two sides, Couscous salad and Lentil salad. What’s great about Tangerine Cafe is that the portions are rather large, so it’s pretty easy to split a meal with another brave soul who’s looking to branch out from basic American food at Disney World, as well. Any of you out there have quick service meals that you just love?! Let me know in the comments below! You’ve hit on a fantastic topic! I love the BBQ Slaw Dog at Casey’s Corner in the Magic Kingdom. I also tried the Sweet ‘n’ Spicy Chicken Waffle Sandwich in Liberty Square and found it to be very tasty. 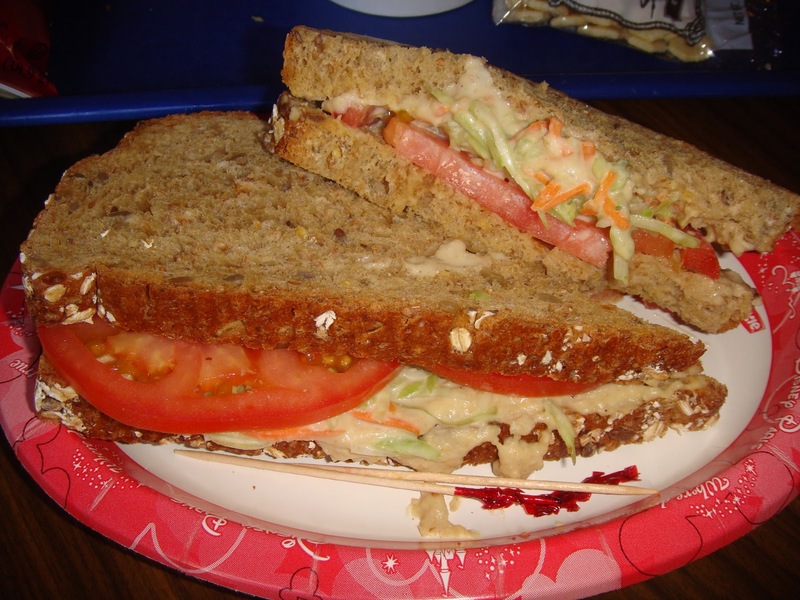 I really like the sandwiches offered in Hollywood Studios, but my favorite sandwich was at the Contempo Cafe at the Contemporary Resort. Lots of people complain about quick service food, but you just gotta know where to look – there’s some delicious stuff out there besides burgers and fries! Great, great article. This should be required reading for anyone who complains about “burgers and fries” at Disney. Glad to see the shrimp po-boy at Restaurantasaurus get some love. I accidently ordered it for my wife last spring, and she ended up loving it. And I loved it. Then we both ordered it when we went back in October. Looking forward to finally getting to try the Sweent and Spicy Chicken Waffle sandwhich in a few weeks. I can’t wait to give the salmon sandwich another shot at Kringla. This used to be one of my favorite snacks in the park but it changed a few years ago and I wasn’t a fan. It looks like a new change has happend and I’m looking forward to it. 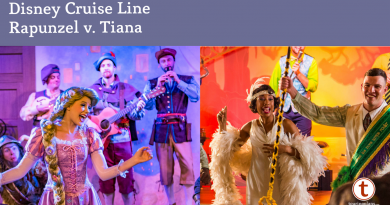 Great article, +1 for Sunshine Seasons – so many options! Remember, when dining at counter service restaurants in AK they accept Tables In Wonderland. Leaving for Disney one week from today! Since we are not doing the Meal Plan this time, this will be great information for us! Thanks! I totally agree with all your recommendations. You really can’t go wrong with Quick Service in the World Showcase. My husband had the best sandwich of his life at Kringla Bakery, and I go crazy for just about anything from Tangerine Cafe. We can’t wait to try the waffle sandwiches, either! No shout out for Earl of Sandwich? I know it’s not in a park but their Original 1762 is to die for. I went their by accident two years ago and now must visit ever trip! Another vote for the BBQ Slaw Dog at Casey’s Corner and one for the Aloha Pork at Captain Cook’s at the Poly. Yum! I love Columbia Harbour House and Restaurantosaurus! CHH has great food and the views from the second floor are great! The shrimp po’boy at Restaurantosaurus is something I came across accidentally almost. I have a food allergy and it’s one of the few foods that I can purchase down there that is MY allergen-free. Helps that it tastes fantastic! Kringla is one of the best keep secrets in the world, IMO. Fantastic sandwiches! We always do World Showcase from Mexico to Canada, so it’s sort of become our go-to lunch spot. Love it! As great as many of the WDW table-service restaurants are, we usually get counter service because we don’t like to spend an hour or more of park time waiting to eat. With all the delicious counter-service options, we still eat great. Boulangerie Patisserie is one of our favorites at Epcot. You can get nice sandwiches or quiche for about $5. I usually can’t even finish it, but I need to leave room for a chocolate pastry!